Pay for what you use with memberships starting from as little as $6 a week! 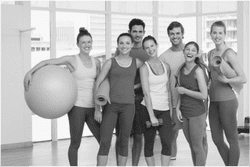 All memberships run on no long term contract agreements which are tailored individually to you and your lifestyle to keep you on track and allow you flexibility. Ask us about our latest deal on our month to month options! ​Call us now on 0411 423 083 for more details! We pride ourselves in providing our members with our utmost support and attention so they achieve their goals in a safe and friendly environment. We know that stepping into a gym can be a scary and new experience, this is why we provide programs and demonstrations so you don't feel lost and move forward to your goals with certainty. We want to make sure you are getting the most out of your training and in the safest possible way, that's why we have a qualified personal training floor coach on the gym floor during our staffed hours to keep you safe and answer any questions and queries you may have. Sometimes you need that little extra motivation of one of our personal trainers or to be in a group environment with like minded people. We have both of these options available for you because we know how valuable that little extra motivation can be. ​Contact us on 0411 423 083 or fill in the form below for more information.